Dear Kimmy-I have had my quilting machine for a couple of years and have noticed that the canvas leaders are starting to look stretched out and dirty along the edges. Do I have to buy new leaders or is there an easier alternative? Kimmy says- Great question! Save your money; you don’t need new leaders, you just need to straighten the ones you already have. This is a very easy job, and will only take an hour or two if you do it yourself. If you ask your husband to help, it will take all afternoon and you’ll probably end up getting in a fight, so take my advice and do it yourself. J Most people don’t realize how crucial it is to have straight leaders, nor do they realize the big impact that taking the time to do this seemingly unimportant procedure will have on their finished quilts. Let me give you the scoop. Before we get started, let’s take a minute to look at how your leaders got stretched out in the first place; Every time you pin a quilt onto your machine, you are applying tension to the center portion of your leaders. A baby quilt might only apply tension to the center 40 inches of your leaders, while a queen size quilt will apply tension to the center 90 inches, but the end result is that if there’s a quilt on the machine, there’s tension on the leaders, and that tension is most often concentrated on the leader’s center section. Since the leaders are made of canvas and canvas stretches, over time this tension will inevitably cause distortion. The tighter you crank your rollers while quilting, the greater the tension on the leaders and the greater the distortion of those leaders. Makes sense, right? Now, imagine a leader that’s had a couple of years worth of quilts pinned onto it. What was once a nice straight piece of canvas has slowly but surely transformed into a U shape, with the belly of the U being in the center of the leader. If you stand in front of your machine, you will see that your take-up leader looks like a right-side-up U and your top and backing leaders look like upside down U’s. What happens if you pin your quilt to these U shaped leaders? It’s going to be awfully challenging to try to get nice straight lines on the top and bottom of your quilts if you’re pinning them to an edge that is anything but straight and you will most likely find that the top edge of your quilt looks like it’s smiling at you while the bottom edge looks like its frowning. The remedy for this is quite simple; straighten your leaders! Before you do anything else, make sure that your roller bars do not have any ‘play’ where they are attached to the frame. They should be tightly bolted in place and you should not be able to shift them back and forth. If this is not the case, take the time to tighten them up. 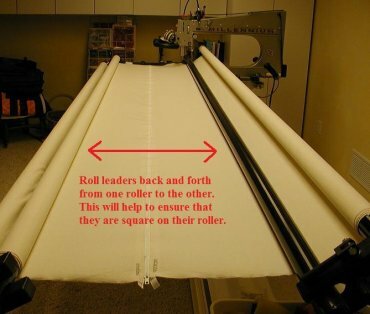 This is an important step because if your rollers wiggle, your leader centers aren’t going to stay centered and it will be difficult for you to line up your quilts properly. Next, pin your take-up leader and your top leader to each other, matching the centers of the two leaders (or zip them together if you have zippered leaders). Unroll the take-up leader and roll that leader onto your top roller. Now, unroll your top leader and roll that leader onto your take-up roller. Do this a couple of times, rolling both leaders back and forth as if you were rolling and unrolling a quilt. (by the way, you should do this every once in a while just to help keep those leaders straighter, longer) By doing this, you will ensure that the leaders are rolled correctly onto their rollers before you start any other straightening. When doing this, you will see right away if your leader edges are straight because, if they are not, the center area of the pinned-together leaders will be loose and floppy while the ends of the leaders will be taut. Be aware that if you have never done this, you are probably going to be surprised at how much warp has occurred over the years! Now position the leaders so that the pinned edges are in the approximate center of your work area and tighten the leaders up just as you would if you were working on a quilt. Bring your machine head over and position it so that your needle is two or three inches above those pinned together edges. Set your horizontal channel lock and stitch a nice straight line all the way across your take-up leader Photo B.
Reposition your machine, reset the channel lock and stitch a straight line across your top leader as well. Unpin the take-up and top leaders, roll your top leader out of the way and pin your bottom leader to the take-up leader. Repeat the roll/unroll process and stitch a straight line on your backing leader, just as you did on the other two leaders. Unpin the leaders. This is the new straight edge of your leader. Do this for all three leaders, allowing them to cool and ‘set’ before rolling them back to their original positions. 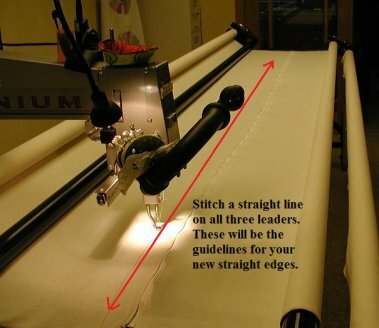 Once you have pressed new edges on all three leaders, it’s time to stitch new hemmed edges. 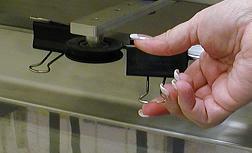 Starting with your take-up leader, position it so that the freshly pressed edge is in the middle of your work area. 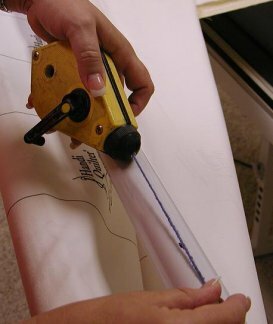 Clamp the ends of the leader tightly to hold them in place, set your channel lock, and stitch the new hem approximately one inch away from the pressed edge. Stitch new hems on all three leaders, and trim away the excess old fabric. Easy peasy pie. This is crucial, because if the centers of all three leaders are not perfectly aligned, your quilts won’t roll straight on the rollers and you will find that you have a diagonal ‘pull’ across your quilts from the mismatched centers. Note; it is only important that you find the true center of your take-up leader. The top and backing leader center markings will be based solely on their alignment with this marking and you may find that, if your leaders were not glued properly in place at the factory, the center markings on these leaders may be slightly off from the actual center. It’s okay if this happens; all you care about is that those marks are aligned with the center of your take-up leader. A note to those of you who have removable leaders which are attached to your roller bars with Velcro; these repositionable leaders are whiz-bang cool because if you get bored with the quilt you are currently working on, zzzzzzip! you can just take it off and attach a different quilt! However, it is vitally important that you make sure that the Velcro strip is attached to your roller bar in a perfectly straight line. You can have the straightest leader edges in the whole wide world but those edges won’t make a bit of difference if your leaders are not straight on the roller bar. Let me tell you how to do this. Do the same thing at the other end. Repeat this procedure for all of your rollers so that each roller has a mark at each end showing the exact top of that roller. Next, have your assistant take one end of the chalk line and line it up with one of those marks Photo G while you take the other end of the chalk line and place it on the mark at the other end. Lifting the chalk line an inch or so off of the surface of the roller, ‘snap’ a straight line extending all the way down the length of the roller. (PLEASE NOTE: Exercise extreme caution when using a chalk line. This chalk leaves permanent marks and you will want to use great care to ensure that it does not get on your leaders, your carpet, your clothing or a quilt!) Repeat for all of your rollers. These perfectly straight lines will serve as guidelines to be used when attaching Velcro to your roller bars. 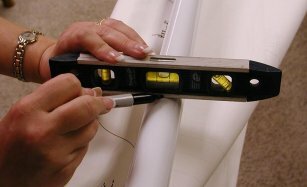 Cut a length of adhesive-backed Velcro to the length of your roller and, using the ‘bristly’ half of the Velcro, line up the edge of the Velcro with the chalk line and press it securely into place. Attach the ‘soft’ half of the Velcro to your leader. Repeat this procedure for all rollers and all leaders. Carefully wipe away all chalk residue from your rollers to avoid inadvertently transferring this chalk to a quilt. 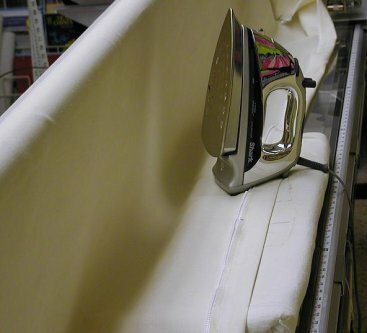 Now, whenever you remove and reattach your leaders, all you have to do is make sure that you place the soft part of the Velcro properly in place on the bristly part and you can rest assured that your leaders are indeed straight on your machine! As you can see, this is not at all a difficult or time consuming process but it is of vital importance if you want your quilts to have square corners and straight top and bottom edges and if you want all three layers of your quilt sandwich to be flat and squarely aligned with one another. Taking the time to straighten up your leaders and to keep them straight by occasionally rolling and unrolling them will make a big difference in the appearance of your finished product. Remember, too, that you do not have to tighten the quilt until it screams during the quilting process! Excess tension will not only distort your leaders faster, it will also cause distortion in the quilt itself. Apply only enough tension to hold the quilt straight and flat, but not so much that you can bounce quarters off of it, and you will find that your leaders will stay straight for a much longer period of time.